This week’s snapshot was taken by Glade Allred, Vernal, Utah, Street Superintendent. 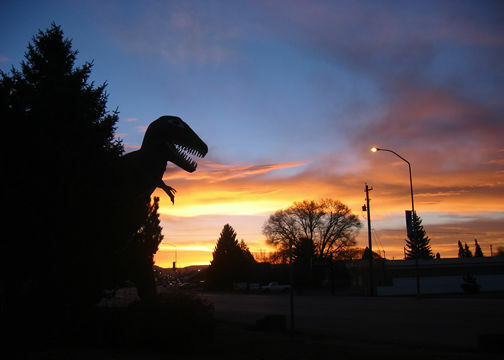 The photo depicts “Rex”, who lives in the North Eastern corner of Utah next to the Dinosaur National Monument. Rex goes to Vernal. This week’s snapshot was taken by Glade Allred, Vernal, Utah, Street Superintendent. The photo depicts “Rex”, who lives in the North Eastern corner of Utah next to the Dinosaur National Monument. Although Rex gives the impression of a daybreak menace, he changes outfits to reflect the holiday season. During the County Fair, for instance, Rex swears off meat for a big slice of watermelon.